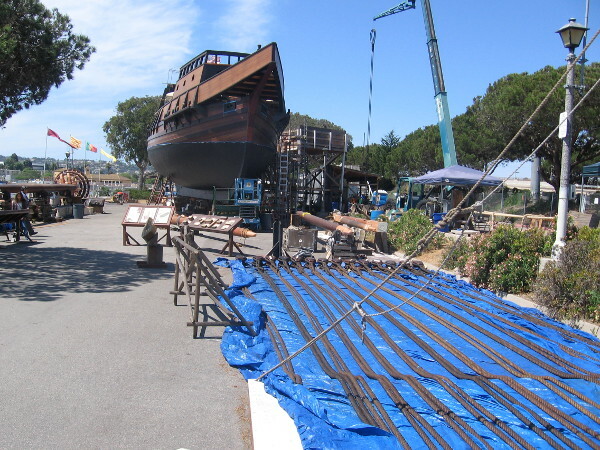 Photos: amazing tour of Spanish galleon build site! – Cool San Diego Sights! 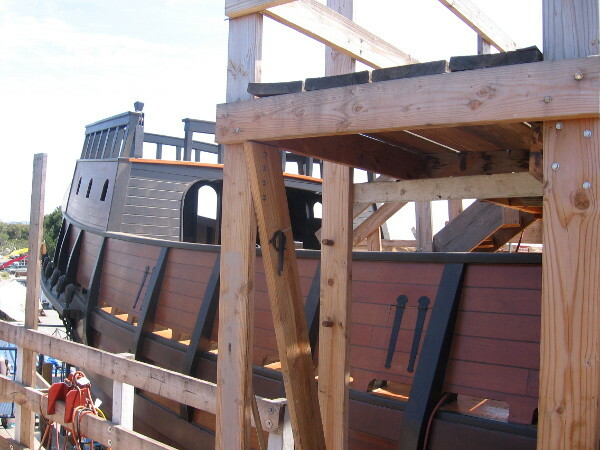 Photos: amazing tour of Spanish galleon build site! Sign at entrance to San Salvador build site. 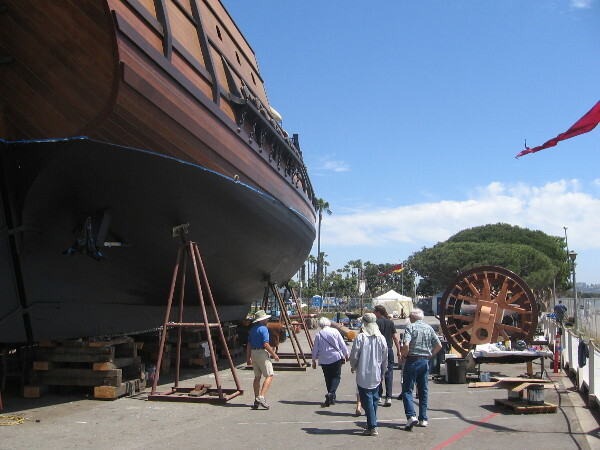 You have a couple more weeks to visit before the replica galleon’s historic launch into San Diego Bay. Yesterday I enjoyed a tour of something so unbelievably cool it almost defies description. Along with my photographs I took some notes, but what I’m about to write might not be perfectly accurate. I’m relying to an extent on memory, which with my advancing age isn’t quite what it used to be. So if anyone reading my captions spots an error, PLEASE write a comment at the bottom of this blog post! 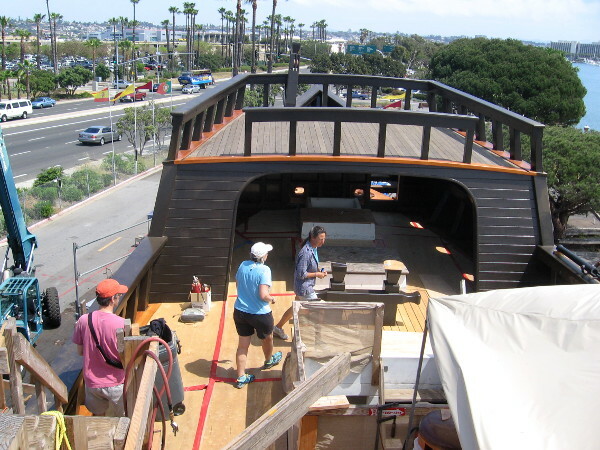 Later this month, the Maritime Museum of San Diego will be launching its absolutely fantastic, historically accurate, seaworthy replica of the galleon San Salvador. 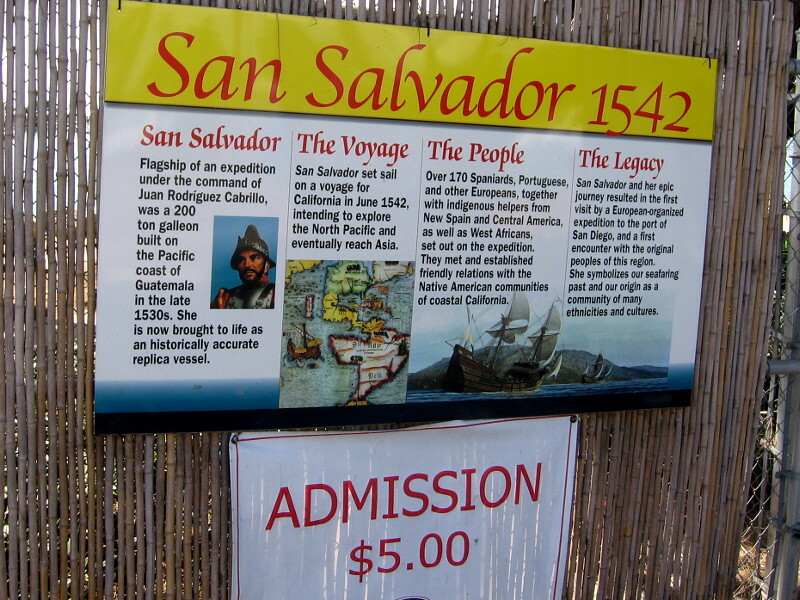 The original San Salvador was the ship that Portuguese explorer Juan Rodriguez Cabrillo sailed in during his voyage of discovery up the California coast on behalf of Spain. 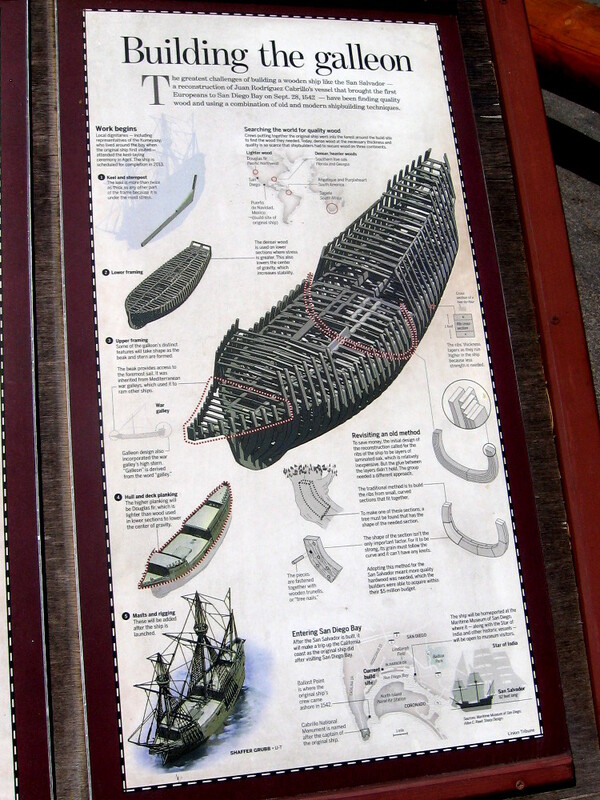 The famous galleon entered San Diego Bay in 1542, making Cabrillo the first European to visit the large, natural harbor. What we call San Diego today he named San Miguel. 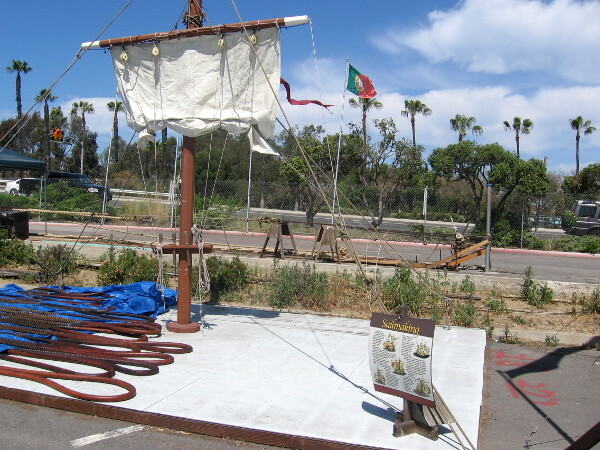 Today, the full-size working replica of Cabrillo’s ship is being built at the west end of Spanish Landing, in an area called San Salvador Village, between Harbor Island and San Diego International Airport. The finished ship will be 92 feet long with a beam of 24 feet. As I understand it, construction has been underway for about four years, and for a variety of reasons has taken a couple years longer than originally projected. 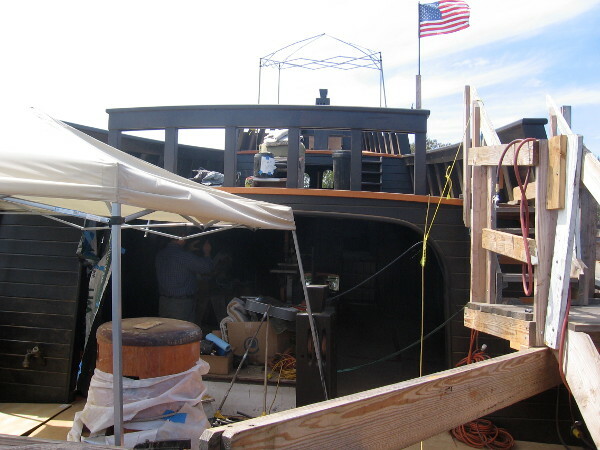 But once the decks are re-caulked, the shrouds tarred, and a few other things finished, the ship’s exterior will finally be ready for its imminent introduction into San Diego Bay! 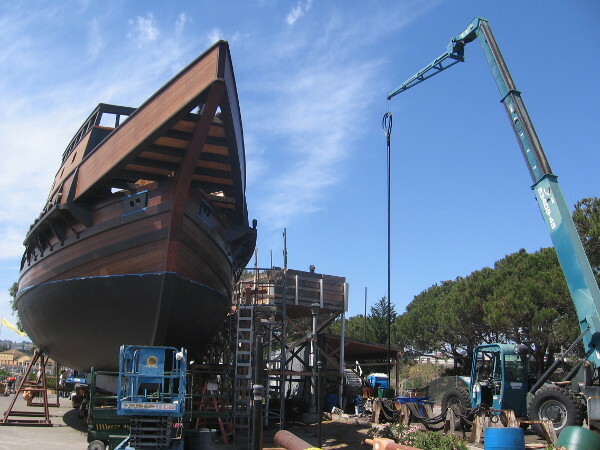 The galleon, which without ballast weighs about 130 tons, will be slowly towed to the Broadway Pier downtown, then lifted by a huge crane into the bay. 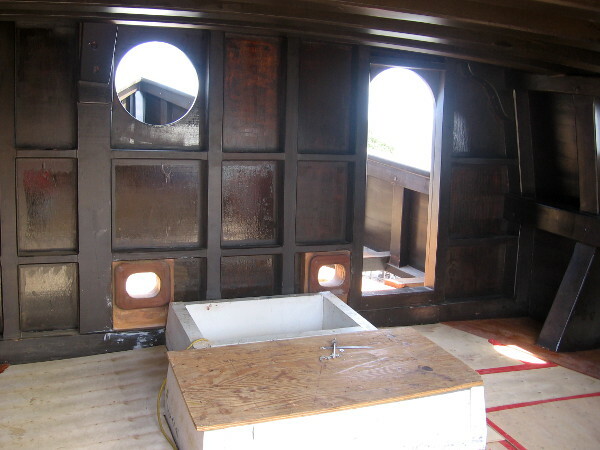 While docked beside the other ships of the Maritime Museum, the interior will be finished, about 60 more tons of lead ballast added, and the vessel’s ability to remain upright thoroughly tested by the Coast Guard. 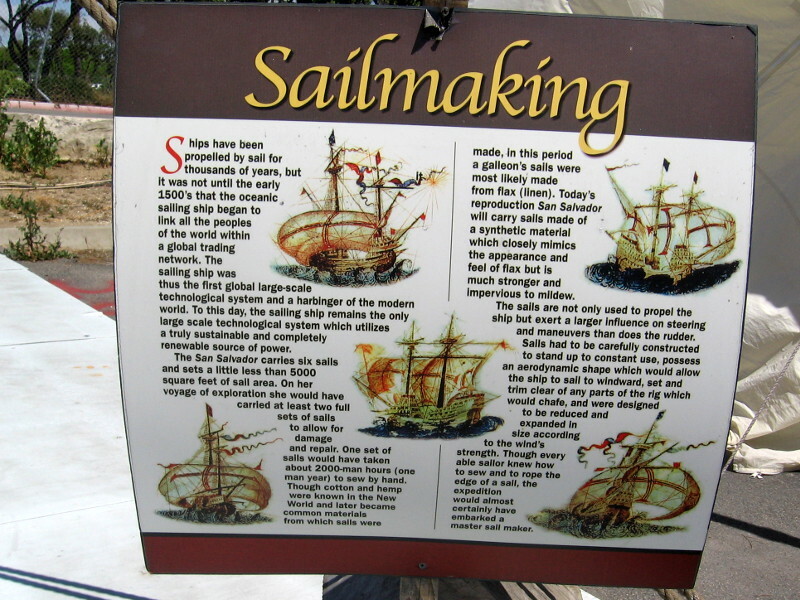 Shipbuilding was the first industrial activity of the New World. 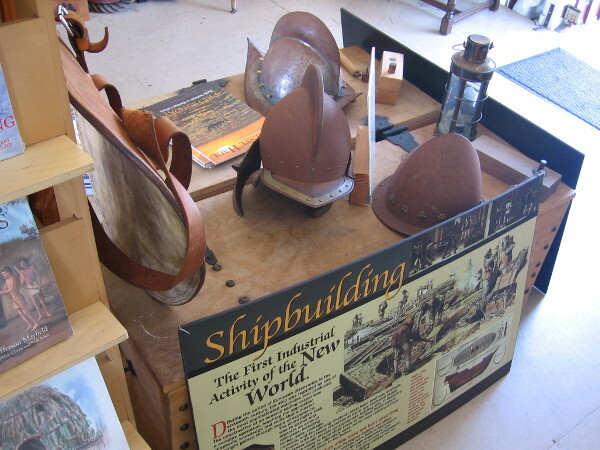 Gift shop at site entrance includes Spanish conquistador helmets and breastplate. 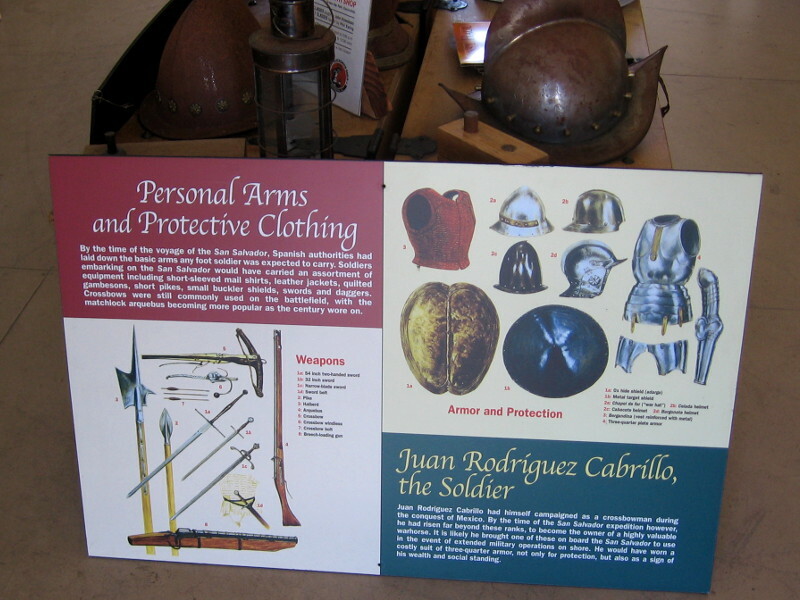 Poster shows personal arms and protective clothing used by the men who sailed with Juan Rodriguez Cabrillo five centuries ago. 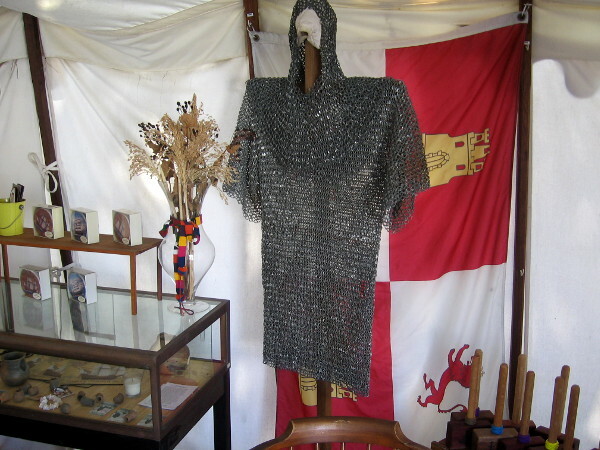 A small museum and gift shop includes many interesting sights, including a shirt of chain mail and flag of the Spanish Empire. 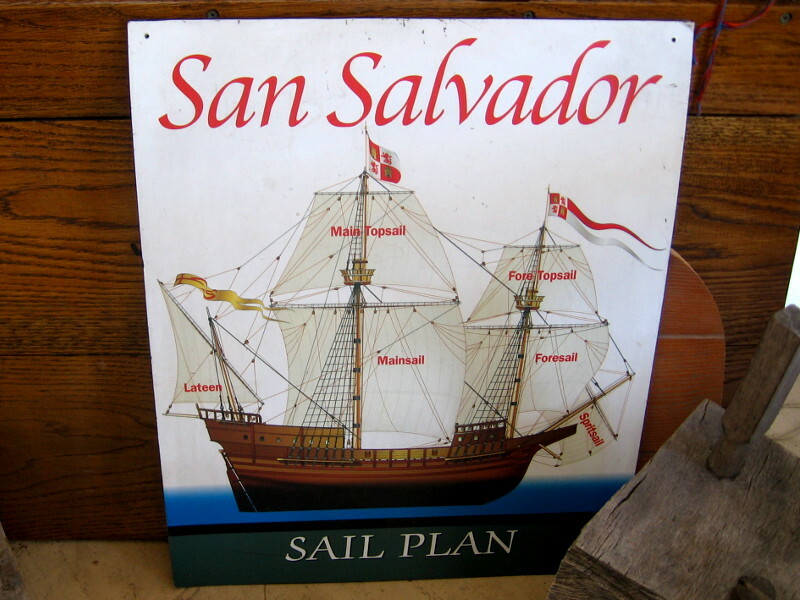 Diagram shows the sail plan for historic galleon San Salvador. 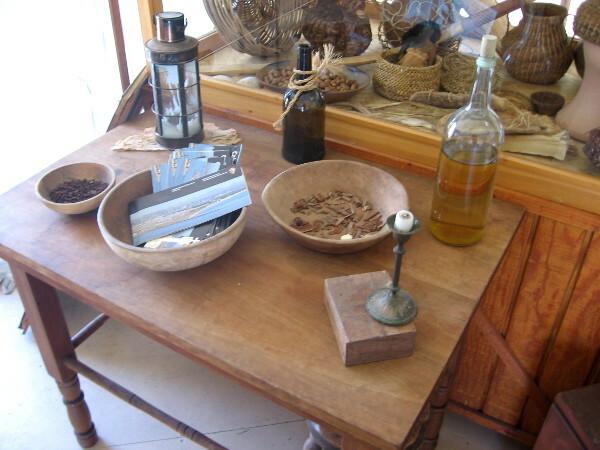 Various items on display include lantern, candle, bottle, ship’s food and native Kumeyaay artifacts. Outside, at the build site, there are many more exhibits. This reproduction of found rock art seems to show sailing ships. 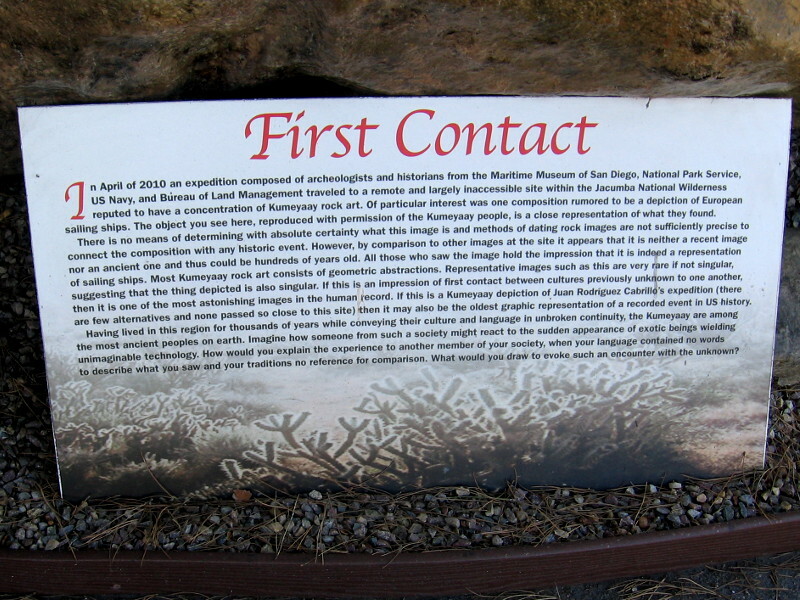 The native Kumeyaay people often visited San Diego Bay. First Contact. 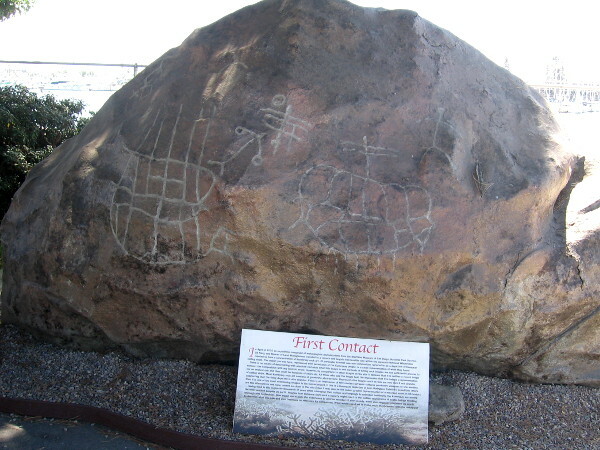 If this rock art is a Kumeyaay depiction of Cabrillo’s expedition, it might be the oldest graphic representation of a recorded event in American history. 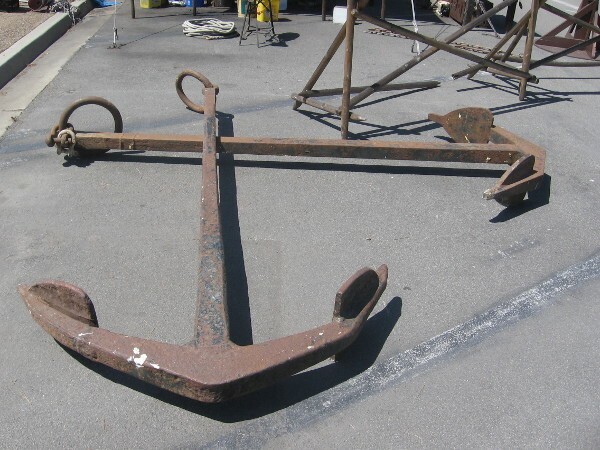 Here’s a huge anchor! I didn’t ask, but I assume it will be used by the San Salvador. 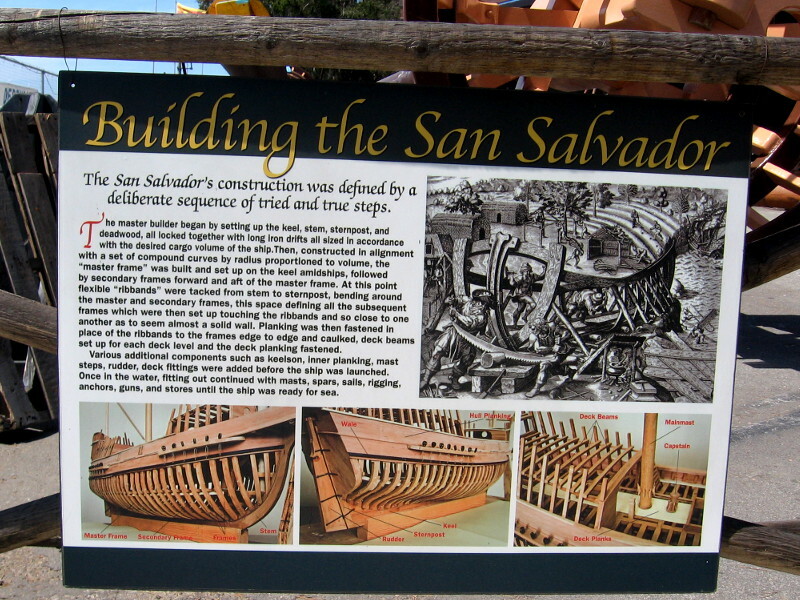 San Salvador carries six sails totaling a little less than 5000 square feet. The sails are not only used to propel the ship, but exert a larger influence on steering than the rudder. View of a small sail suspended from a yard, with Harbor Drive in the background north of the build site. 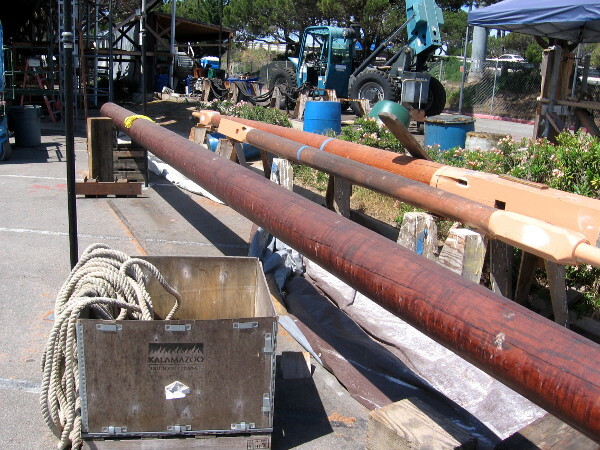 Suspended from a crane is a shroud (rigging that helps hold a mast) that’s being tarred. The bow of the galleon comes to a sharp point at its beak. Iron in an undeveloped region of the New World was a precious commodity. 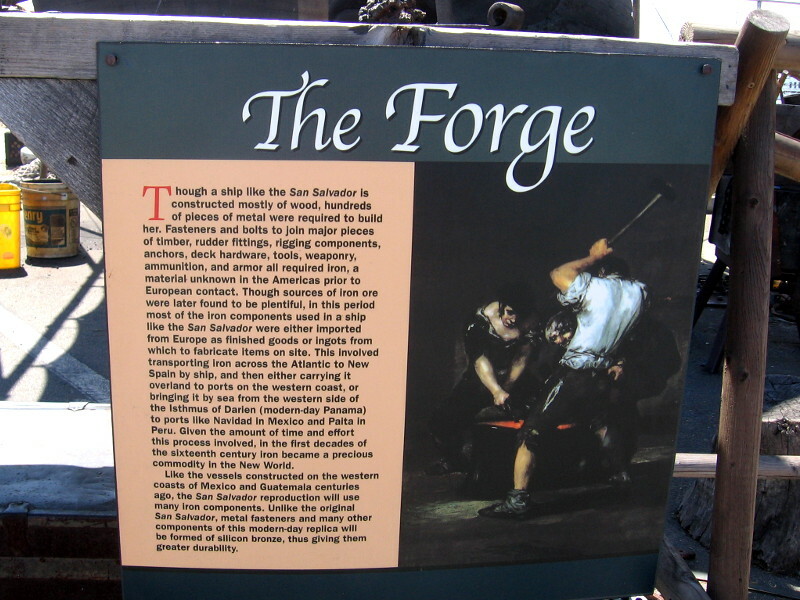 Imported ingots were often used to forge various fittings and hardware. 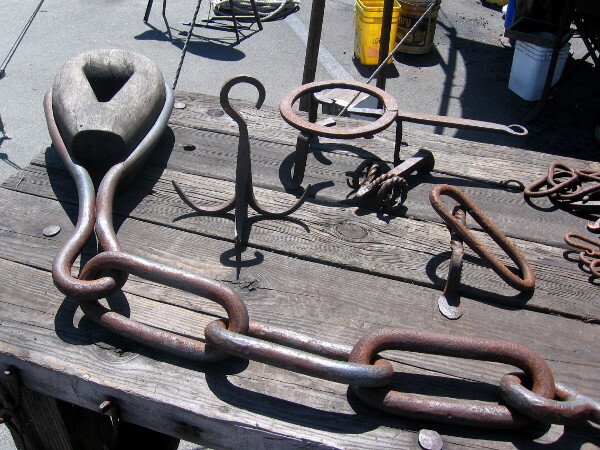 Hooks, chain links and other iron instruments were crucial to sail and maintain a large ship. 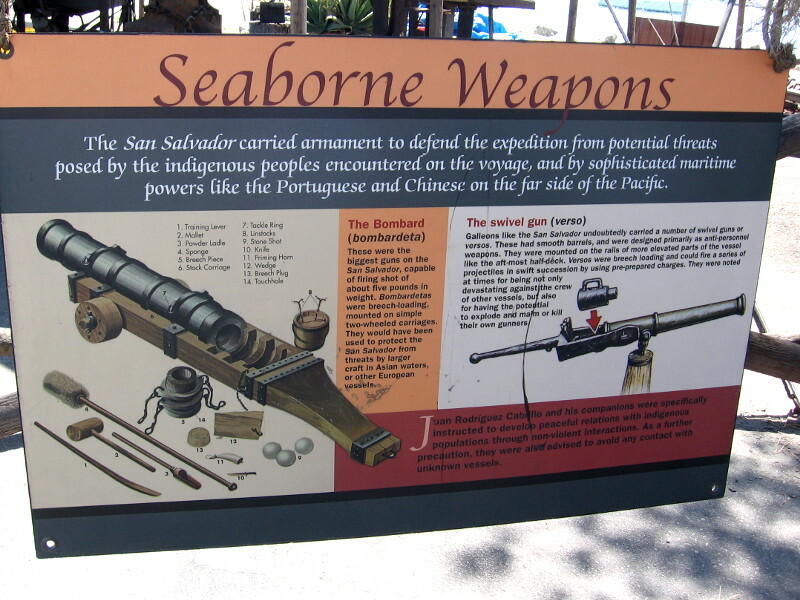 The San Salvador carried armament to defend the expedition from potential threats. 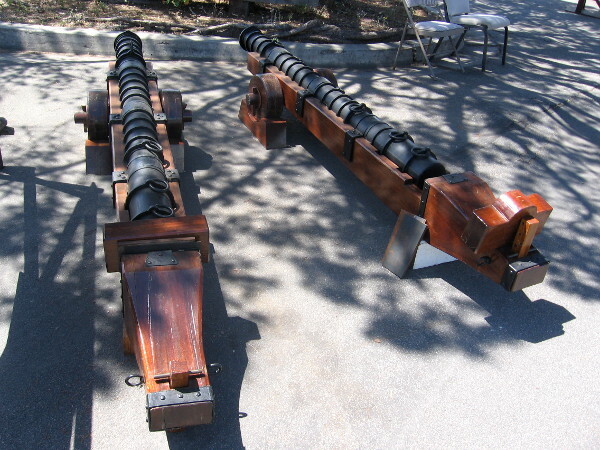 The cannon-like bombard and swivel gun could be fired from the deck. 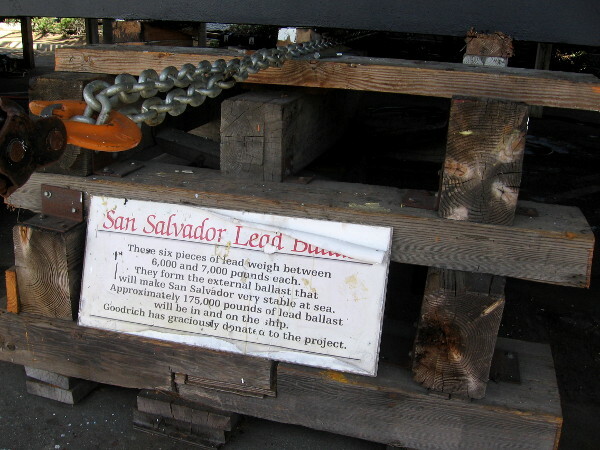 Two bombards on display at the San Salvador build site. They could fire shot about five pounds in weight and were mounted on wheels. 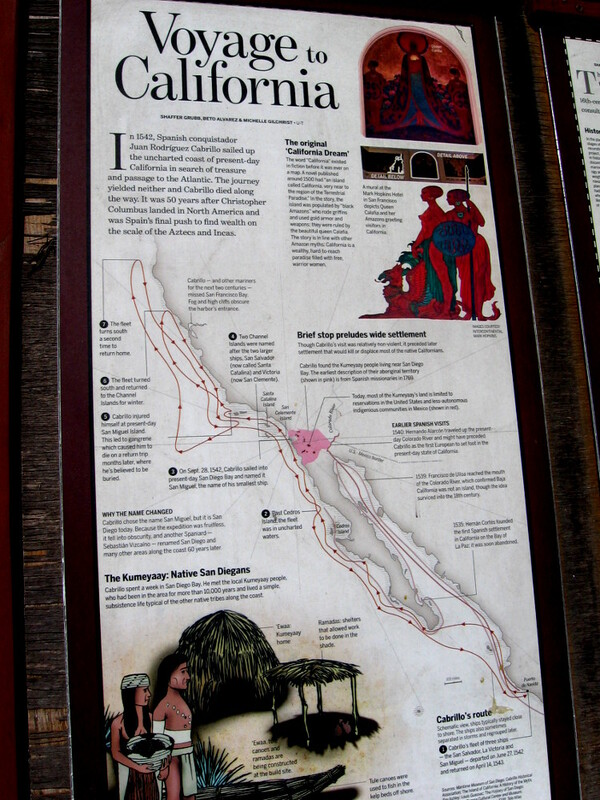 Detailed map of Cabrillo’s route up the California coast. He found neither treasure, nor a passage to the Atlantic. There are no blueprints for the galleon San Salvador. 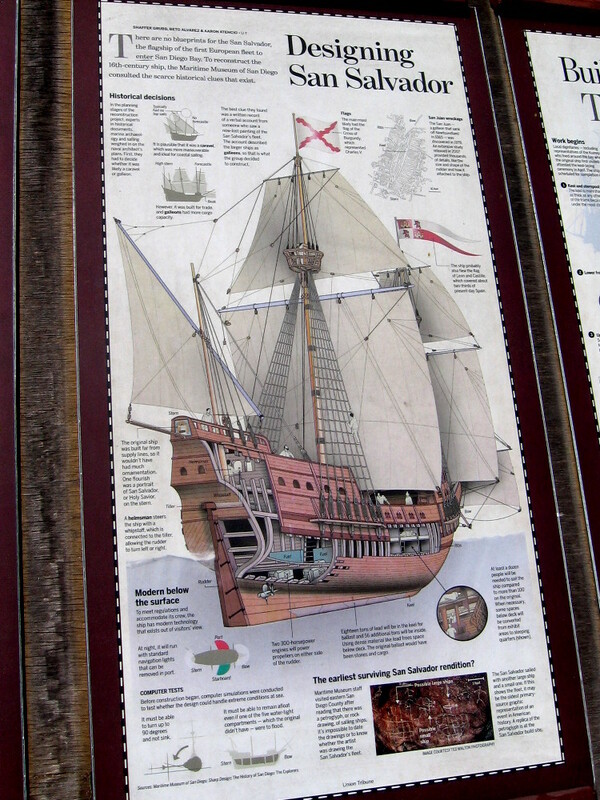 To reconstruct the 16th century ship, the Maritime Museum of San Diego used scarce historical clues. 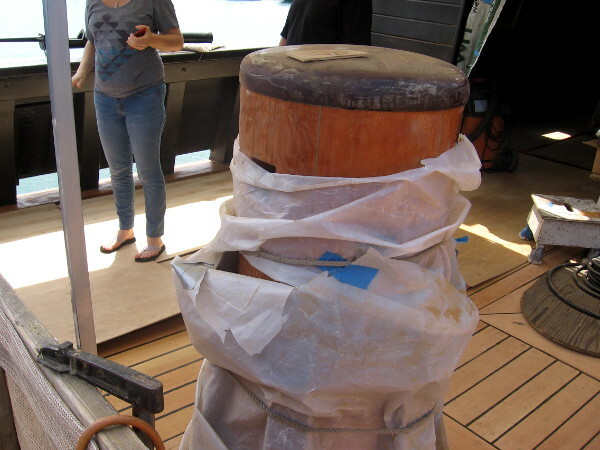 It was difficult to find the right kinds of wood for different parts of the vessel. 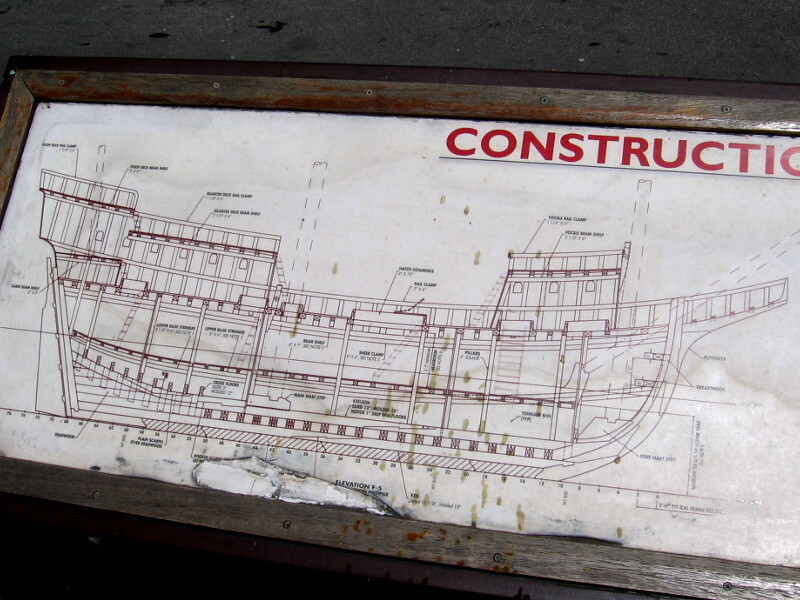 Both old and modern shipbuilding techniques were used. 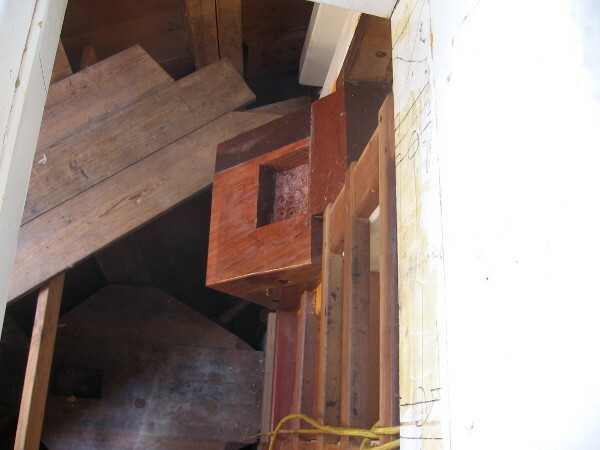 Wood mast segments and yards are coasted with linseed oil, I believe. 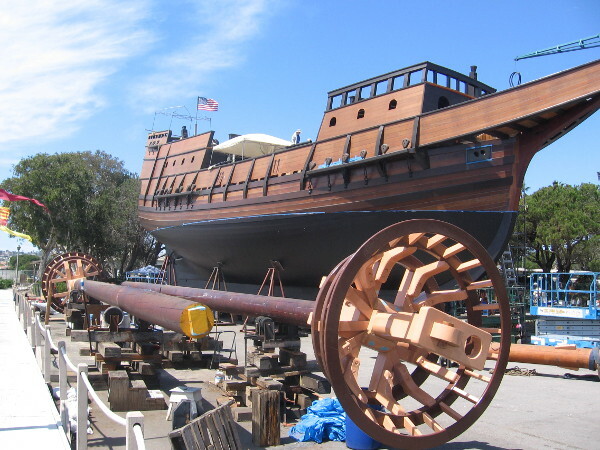 They’ll be installed once the ship is afloat in San Diego Bay. Approaching the impressive reproduction of the historic galleon. Just imagine going for an ocean sail in this! Detailed schematic shows framework and beams that support decking and hull. The master builder sets up keel, stem, sternpost and deadwood, locked together with long iron drifts. The master frame is then built. I believe these are the lower halves of two masts (main and fore), each ending in a crow’s nest. 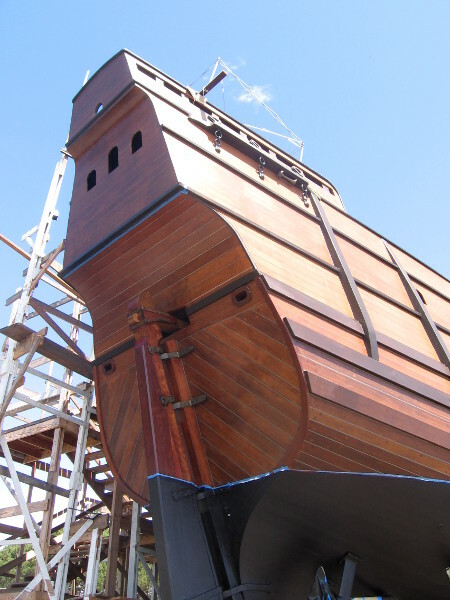 A look at the super hard wood hull of the galleon San Salvador at Spanish Landing. 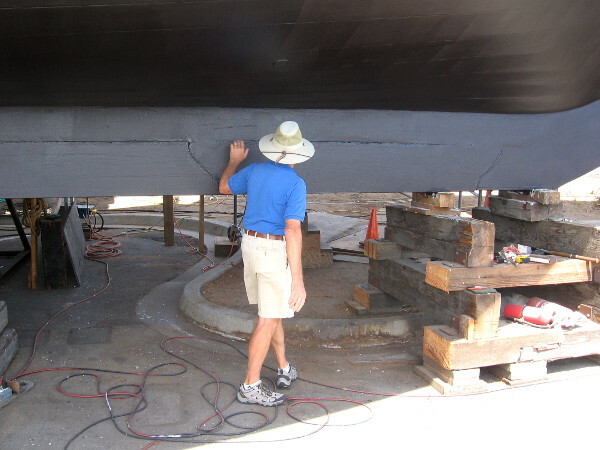 Volunteer tour guide shows how six segments of heavy lead are attached to the keel. Each piece of lead weighs over 6000 pounds. The lead was originally used for the drop hammers of Rohr Industries in Chula Vista to form aircraft parts. A small tour group investigates the amazing galleon on a sunny San Diego day! The high stern of San Salvador. The rudder is attached to a tiller. That propeller below (and an eventual engine) is a modern convenience unknown by Cabrillo! 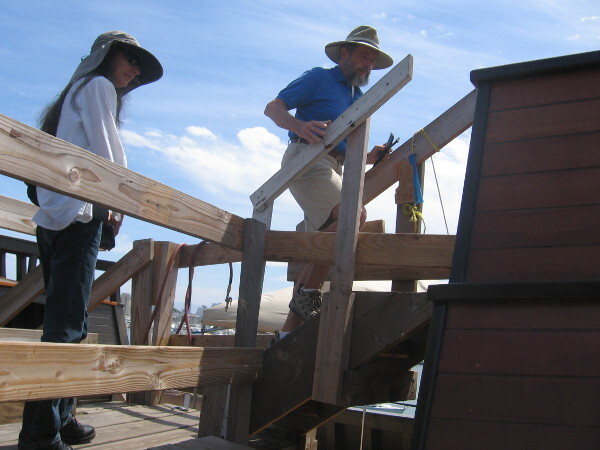 Our group climbed the steps of scaffolding to check out the hull, upper deck and aftcastle. We’re shown where a shroud connects to the ship’s side. 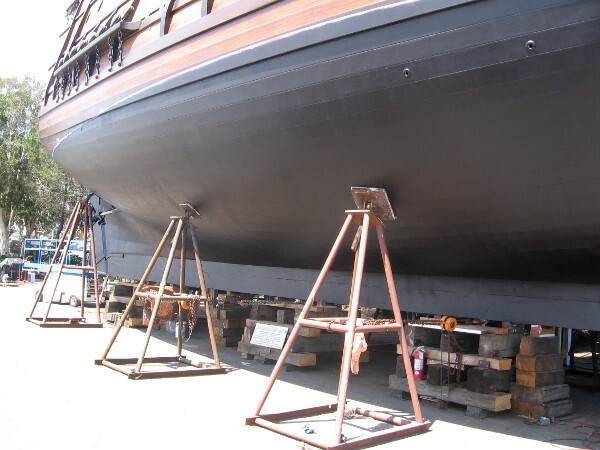 The darker looking lower portion of the hull is made of hard wood, which is heavier than water. View of the San Salvador galleon while standing atop the aftcastle. Work to finish the vessel’s deck and interior is underway. 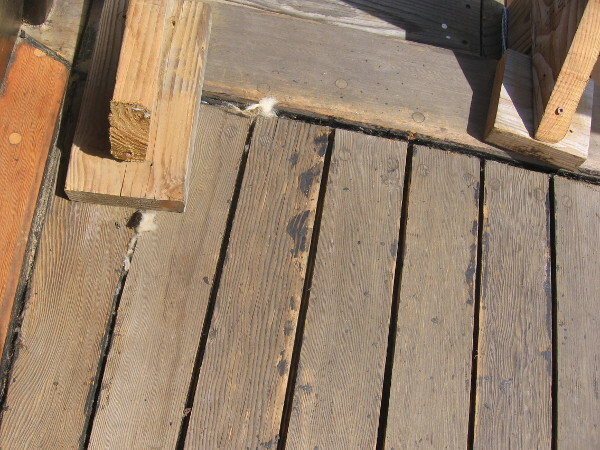 This deck will be re-caulked soon using cotton, hemp rope and synthetic tar. Earlier caulking with less modern materials was unsuccessful, if I recall correctly. 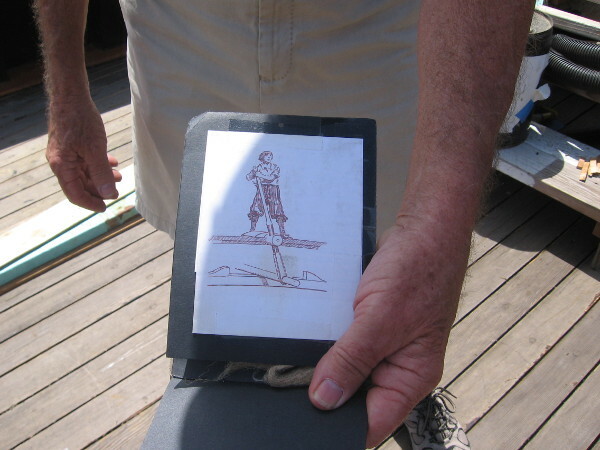 Sketch of helmsman steering the galleon with a vertical lever attached to the rudder’s tiller. He had a window to look through in the aftcastle. 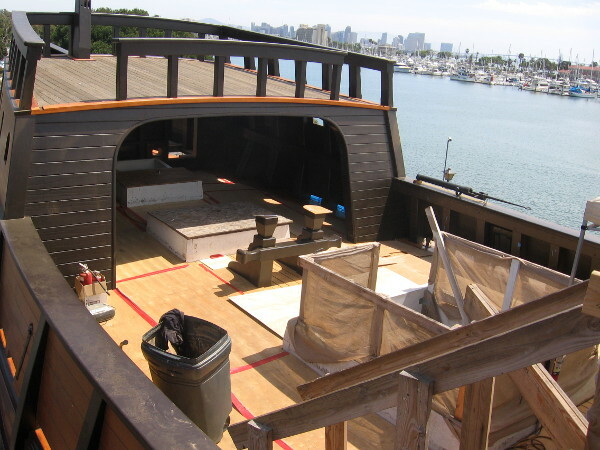 Looking back at the aftcastle and rearmost poop deck from the center of the upper deck. You can see the window through which the helmsman peered. Capstan is a revolving vertical timber that projects through the deck. 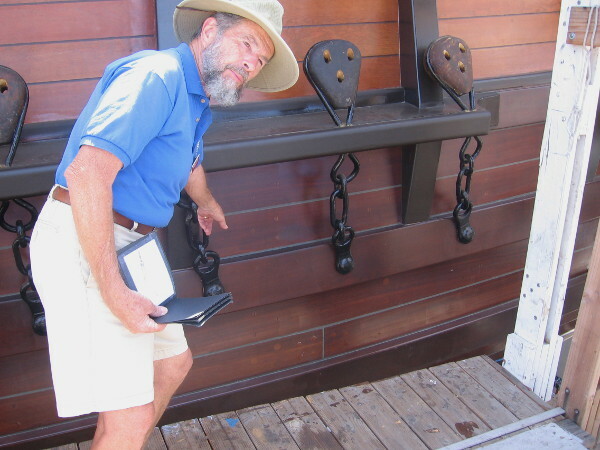 Bars will be inserted and used by sailors to turn the capstan, hauling ropes or chains. 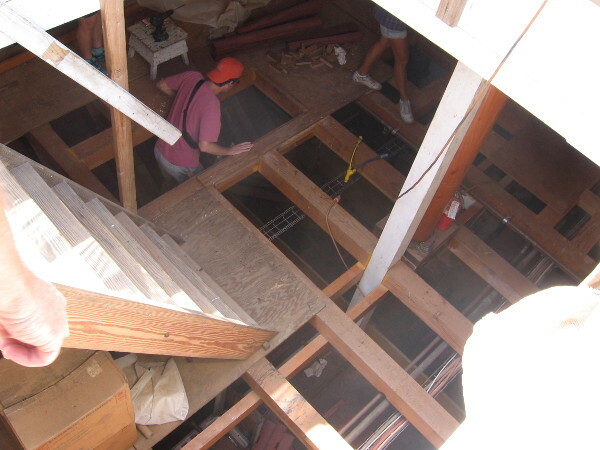 This is one of five separate water-tight compartments being worked on below. Bunks will be contained here, for journeys out to the Channel Islands eventually. Under the forecastle, looking toward the bow’s beak. The two holes beside the rectangular chain locker are hawseholes, through which the anchor chain is lifted or lowered. Looking straight down here you can see where the foremast and bowsprit are seated. Wow! Is this cool! How often does one get to walk around an actual honest-to-goodness working galleon! To enjoy future posts, you can “like” Cool San Diego Sights on Facebook. or follow me on Twitter. This is so cool ! I can’t wait to see this! Love your blog! It would be even more awesome to go out sailing on her!!!!! Thanks for this interesting tour. There were some nautical and/or ship terms used here that I don’t understand – but that’s OK. Just to see how this galleon is being constructed is awesome. Great post! Excellent photos. It did look a bit strange! Previous Previous post: Beating cancer with beautiful tile artwork. Next Next post: Chalk voices: strong feeling and thought.